I didn’t want to create a dependency to a certain service bus or event aggregator so the first step for a user of my library is to create a proxy. It’s done by implementing SignalR.EventAggregatorProxy.EventAggregation.IEventAggregator. It comes with one method Subscribe. The library calls this method and supplies a handler that you should call when events are fired. Example of a proxy class. I listen to any event implementing Contracts.Events.Event when one fires I forward it to the library using the handler. Do not forget to register the class with SignalR’s dependency resolver. Now that we have client side proxy objects of the server-side events we need a API for the client to subscribe / unsubscribe to events. We use the subscribe function, first we tell it which event we want to listen to, note that it’s not supplied as a string but rather the reference to the constructor for the specific event. Next argument is telling which function should handle the event and the last argument tells in which context do you want to be in when the event fires. When a connection dies all events will be unsubscribed, but you can also unsubscribe using client code. This will cause all subscriptions for a certain context to be unsubscribed. This is especially important when your site is a Single page application since no connections will disconnect by them self. You get a certain level of security out of the box, the client will only receive events that inherit from a special base class defined by you. Additionally you can have logic in your proxy that only forward certain events to the library. But this is not always enough. More often than not a client should only receive a selection of the events. This is done using the constraint API built into the library. 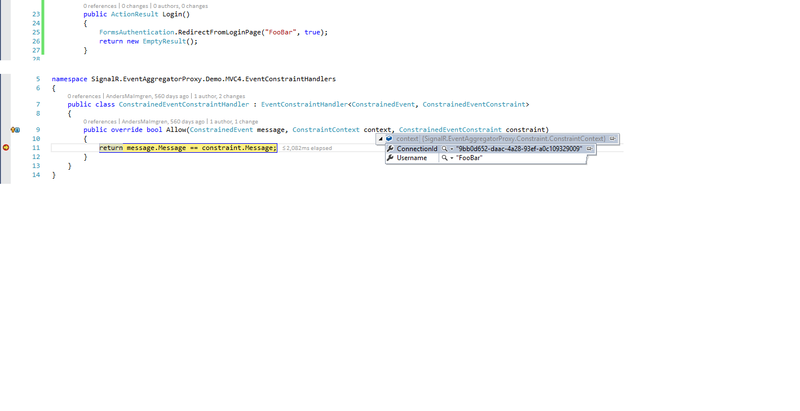 Implement SignalR.EventAggregatorProxy.Constraint.EventConstraintHandler<TEvent>. It has one method called Allow. This is very useful when you want a user to receive updates only for a entity with a certain Id. This occurs in the Handle() method of the EventAggregatorProxy class, i.e. I could drop back to SignalR 2.0.3, but I was curious if you might happen to know why this might be occurring? (I am also able to see this behavior in your demo MVC 4 project). Many thanks, and have a great day! It seems to be backwards-compatible when instantiated (as in the EventAggregator code) or usable as IHubConnectionContext (as in the unit tests). All I needed to do was update the SignalR .NET core libraries to version 2.1, rebuild, and re-deploy. Once again, thank you for such a great library! Thanks for your kind words, I’m really glad you liked it! Yes, I noticed this just a few days ago but haven’t had time to fix it and deploy a new version, will do as soon as possible! Hi Anders, I have been searching for something similar. My requirement is this, I want to be able to set a user as offline when viewing their profile without refreshing. Like this: when the user’s last connectionId is disconnected, I set the user as offline and update their profile without refresh. Now the problem is, one or n number of users may be viewing their profile at anytime. Is this possible using SignalR EventAggregatorProxy? By the way this is the awesomest signalr extension I seen! Whether I am able to use it in this project or not this one is just super cool! We should push for Damian and co at SignalR to look at this library and find ways to integrate or something. I am doing that right away! The github page says ‘A handy wrapper for SignalR Hubs.’ that indicates that its just a wrapper around the hubs generated by the Signalr proxy script? If that is true my code should be able to run along side it. Just a note, if you use Angular you should create a wrapper around my client side library that marshals the controller scope for you. If you create such a wrapper I would be more than happy to include it. It works, but there are many different message types that I will eventually need to handle, and as you can see above there are several “hops” involved in getting the server-side event to the client-side subscribers. (It’s probably irrelevant but I use Prism’s EA on both server and client sides). Is your library designed to replace this sort of thing or have I misunderstood its purpose? I’m struggling to understand the documentation and samples, and “which bit goes where”. I’m probably being dumb but I’ve not been able to find an example of server-side code used to publish a message, nor how a .Net client would subscribe to it. TBaseEvent is a event that all your messages must inherit. Make sure your messages are defined in a seperate assembly that both server and WPF client can share. Please let me know if you have any additional question. Do you have eventually a working sample for a self-hosted Owin/Katana server using the SignalR.EventAggregatorProxy ? Do you have any workaround for this problem ? It seems BuildManager.GetReferencedAssemlbies requires a running ASP.NET application, thats an oversight on my part. Is it possible to use the SignalR DependencyResolver and override the AssemblyLocator ? The Boostrapper Init() method from SignalR.EventAggregatorProxy has “hardcoded” the usage of the BuildManagerAssemblyLocator. … one more question regarding the Subscribe() method in the EventProxy class. The username is extracted “hardcoded” from the User property of the HubCallerContext. In my case the client is a .NET console application, and the above User property is null. Do you see any workaround for that ? Ok, thanks. I solved the custom IAssemblyLocator, but I cannot solve the username problem. I am using a server generated token to authenticate the service calls. The server generates the token only after the user credentials from the client have been validated. The client uses this authentication token in all subsequent calls, Thats why in my case the User property of the HubCallerContext is always null. Cant you wait to subscribe until you know the user is authentication correctly? That way the Identity should be set correctly. If not it seems something is wrong, SignalR uses the built in pipeline for this. Yes, I am testing also with .NET Client. Would be possible to send an access token when connecting to the EventAggregator SignalR hub ? On the Server side I would then add to the signalR pipeline in Owin a custom authentication Provider which checks the access token. Where does the ConnectionToken returned by the EventAggregator Proxy as result of /signalr/negotiate Client calls actually come from ? I would actually like to use the same bearer token for web api and signalr. We do nothing special here, if setup correctly SingalR should supply you with the Username. It sounds like there is something wrong with your setup. I have only tried forms auth and windows, but any type of authentication should work if you use the standard pipeline for it. On the client side the user would send first its credentials (name, password) over a web api call and, if validated, get the access token as response. The same access token would then be sent as query string when connecting to the signalr hub. I edited my last comment. Please see it. You must make the .NET pipelin aware that the user is logged in so that the standard pipeline works. Is there any sample with the usage of the “Action<IHubConnection) configureConnection" optional parameter in the EventAggregator Init() method available ? The Hub does not need to know anything about authentication, if everything is setup correctly User.Identity should be set and everything should be good to go. I would try this in a separate project with a Simple Hub ,get it to work there first. I took a look into the SignalR EventAggregatorProxy code. Would be possible please to extend the implementation and add as option the queryString as additional parameter in the EventAggregator Init() method (or add a new InitExtended(…) method, to not break compatibilty) ? The queryString can be set only in the HubConnection constructor, the usage of the “Action<IHubConnection) configureConnection" would not help in this case. I need to look into this, it sounds like a hack, authentication should be separated entirely from our code. It is separated, the extension I am asking for has actually nothing to do with a hack. There has already been foreseen a method to “adapt” the HubConnection through the the usage of the “Action<IHubConnection) configureConnection". I was just asking to foresee also the possibility to set the queryString for the HubConnection, as this can be done only in the constructor. I have using same concept where I have constraint event which filters on AgentId and from Angular JS I am using different agentIds to subscribe. Somehow when I open two browsers and both with different AgentIds some of messages from AgentId 1033 appearing in 1035 window. Could you please point me to right direction? I am using with Constraint events to allow based on AgentIds. My two browser instance subscribe with AgentIds e.g 1033 and 1035. But some how some messages from 1033 appearing in 1035 window. Could you please point to right direction where I am making mistake. Are you planing upgrading your package with latest versions of included packages? I have plans on moving to .NET Core for the project. But I dont hava a client currently that needs the project and I dont have time to update it without good reason sadly. Thanks for your reply! We will use MVC and .NET4.6.2 only. We try with the current package, if we encounter some issues, I’ll look into it, an update the included packages, and create a pull request. Hi Jonas. Core version is now released.